I once went into a 14 year silence from my compulsive eating recovery support network after telling everyone I was okay and not in need of help. Then I disappeared (moved 1200 miles away) and gained close to 200 pounds. This was in the days before cell phones, Email, blogs, tweets and Facebook. Food addiction is a disease that thrives in isolation. f I am ever again silent for long I hope people will seek me out and care enough to dare to question my change in communication habits. It is not normal to suddenly suspend all contact with others in our face to face world. Our cyber world is not so different. Food addiction is insidious. When I am in my disease I can become a coward, a liar, a cheat and a thief all the the name of the next bite of food. I hide and if I am allowed to be in isolation I only get worse. It is a silent scream. 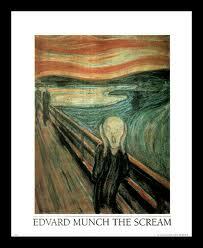 There are many types of silent screams. When my brother (diabetic and double amputee) was in ICU last week one of us found he had M & Ms in his bed. I'll spare you his reason for having the chocolates at his bedside, in an ICU unit, just days after having a second foot amputated. I know this: it is the silent scream of someone who has an addiction and is suffering physically, emotionally and spiritually. Whether he can see this or admit it does not change the fact that he is hurting. It is hurtful to see people I love suffering with this sickness of food addiction. There is nothing I can do to help him except to love him by not joining him in that misery. Silent screams come in all ranges of pain. Today the love I have for my brother has to be expressed by my continued commitment to keeping the pounds off because there is healing in recovery from food addiction and sharing that hope is all I can do. Is it possible to help people who are suffering from the deadly effects of food addiction if they are not willing to accept that there is a problem? You can only help those who truly want to be helped. The best thing you can do is live by example. The suffering of the food addict is profound, but yet often unrealized by even those who are closest to the addict. Many of us who frequent this forum suffer greater pain than we let on. I would guess that your brother is in great emotional pain, and I know that you understand that. But Lori is right--sometimes living by example is the best we can do for others. Blessings to both of you. I agree - you cannot do anything except show by loving example what can be done if the addict is prepared to be honest and do what is required each day. For those of us with success in achieving and maintaining weight loss our words are too often heard as a judgement or criticism by those suffering rather than as the hope we wish to offer. There is a saying that our children seldom do as we say but rarely fail to imitate us. I believe this to be true of all humans. If your brother can see you living a contented and satisfying life then he may become willing to approach you for help. I totally understand his denial and `comforting' himself at this frightening time. Knowing you are the person to have inflicted injury on yourself does not make it any less painful. Thinking of you and your family at this difficult time. Praying for your strength to maintain your equilibrium and that your brother may have some insight into the truth of his situation. When I was suffering with chronic foot pain from my neuropathy and autonomic neuropathy was causing chronic constipation, I felt so hopeless. I was lying to myself stating "I am doing everything I can to lose weight" and to get healthy. The problem with today is we don't know what healthy is we don't know just controlling your portion sizes and limiting bad snacks is all it takes. People will see me eating a weight watcher snack or measured quantity of chips and say "can you eat that?" Ah yes, as long as its measured and its planned. Perhaps all your brother needs is direction. I know you live apart from each other so you can be there influencing him in "how" to eat. Will he be willing to find a OA group or WW group there where he's at? Hang tough Jane, remember you have to take care of yourself first. No one can hide from Diabetes, but we can prevent it unless its T1. I always think of the enablers when I see an article about someone who weighs hundreds of pounds and hasn't been out of their house in years. I have faced three different, and equally awful in their own way, diabetes stories in the last couple weeks. One was a funeral for someone with 5 grown kids and 13 grandkids. We live in a society that looks to 'manage' diabetes instead of eating to not have diabetes. And if the person is a food addict and diabetic, this doesn't work (in my opinion). I never know if this hits me so hard because I am insulin resistant and would BE that person if I had not cleaned up my food, or what. All you can do (in my opinion) is take care of yourself and not be an enabler/codependent to him. So sad about the state your brother is in. Don't you just wish you could fix it? Keeping yourself healthy and supporting him is the best thing you can do. Thinking of you!